Lourdes School Quezon City traces its humble beginnings to St. Francis of Assisi who followed the poor and crucified Christ and loved humanity and all creations so deeply, that he is known as “one of the beloved of all the saints”. This charism of St. Francis impelled the Order of the Friars Minor Capuchin (OFM Cap.) to preach and labor among the people, rich and poor, learned and unlearned.The first group of Spanish Capuchins arrived in the Philippines in 1886 to serve as iterant preachers, giving retreats and popular missions. The World War II, which completely destroyed the Lourdes Church and the mother house in Intramuros, also reduced the capuchins to a minimum. In 1954, Rev Fr. Adolfo De Echavarri, then the superior of the Order in the Philippines, together with the other priests, conceptualized the establishment of schools as a means of evangelizing the community; thus, the birthing of Lourdes School, Quezon City. 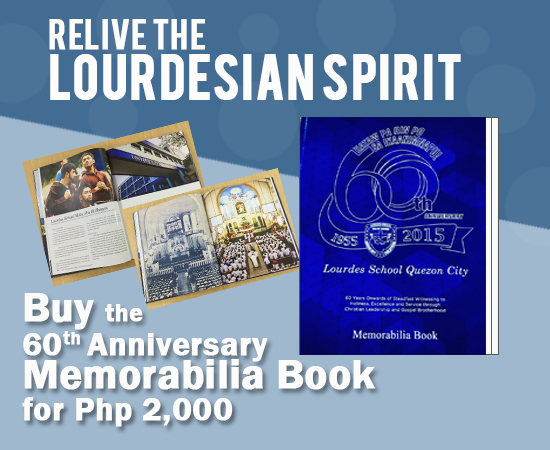 The Lourdes School Quezon City started out with just 11 well selected lay teachers with Fr. Jesus de Ansoain as Rector and principal. Since then, it has emerged as one of the finer schools in Metro Manila. The years that followed saw a significant growth in the small Franciscan community that the Capuchin Friars stated. To the original storey building was added a fourth floor which became ready for use in 1959. The years that passed saw the students grow in number, necessitating the erection of a new building. In May 1967, the construction of a new building to house the high school department was completed. The 1980s was a period of significant milestones to the school. The philosophy of life in education, “Becoming Like Christ”, was officially adopted, and the school’s vision was formulated. The vision specified six manifestations of integral formation of learners: assiduous search for truth, sacramental prayer life, preferential option for the poor, joyful bearing of one another’s burden, accountability and responsibility for assigned tasks and joyful and meaningful celebrations. The decade also highlighted the Capuchins’ spirit of extending peace through fraternity and community building. In 1984, LSQC forged a deeper fraternity relationship with the other Capuchin schools in Metro Manila – St. Anthony of Singalong, Sta. Mesa Parochial School, Lourdes School of Mandaluyong – by forming the first Inter-Capuchin Schools athletic and Academic Meet (ICASAAM) among the four Capuchin schools in Metro Manila. After several years, with St. Anthony School and Sta. Mesa parochial School being turned over to the diocese, Lourdes School continues to foster such relationship through yearly dual meets. The early part of 90s witnessed the strengthening of both the academic and non-academic programs. Subjects and curricula offering were continuously evaluated and regularly updated to meet the demands of the times. Also, later part of the decade saw the formulation of the Core Values Grid that permeated all the activities of the school. The Social Action Program (SAP) of the school also proves to be realization of St. Francis’ works. Regular outreach activities to Jose Rodriguez Memorial Hospital (formerly Tala Leprosarium), NARCOM Unit in Bicutan, and san Jose Manggagawa Catechetical School in GMA, Cavite are being organized every year. The pursuit of excellence had led to the high school’s first accreditation in 1992, and the grade school department in 1997. Since then, preserving the school’s accredited status is continuing to create a stronger dynamism for the teachers ands students. All the educational undertakings, programs, projects and activities are geared towards the attainment of Excellence, Holiness and Service. Teachers, more than ever, are committed to molding Lourdesians who are responsive, socially aware and culturally sensitive. This sense of excellence is coupled with the intentions of not only honing the students’ craft by also doing service in the spirit of brotherhood. Today, LSQC boasts of a roster of administrators and teachers who are continually making abstractions about and practices pedagogical approaches which would be described as constructive, humanist, reflected, research-oriented, integrative and transformative. Aware that the new millennium calls for constant networking with other Franciscan schools, parents, alumni and other stakeholders, LSQC, together with LSM, has embarked on yet a major project to formulate a Franciscan pedagogy that will define and make succinct the Franciscan charism and philosophy of education. The new millennium poses to even a greater challenge for LSQC as this has ushered in a frenzied demand to cope with fast paced technological advancements and other challenges that continue to threaten Philippine society. LSQC faces these challenges head on, fully aware of the unwavering support of the Parents Council, Inc., the Parents’ Foundation and the LSQC Alumni Association and clear in its mission to evangelize, teach more students “to become like Christ”, and continue to incarnate in their daily lives the Gospel values.